This is an article about King Ahkenaten's "cult" of monotheism and how it might have influenced the monotheism of Israel. This article comes from the Biblical Archaeology Society, so the information contained in the article should be accurate. This is an informative article about Akhenaten and his reign. The article discusses his controversial switch to the cult of Aten, the Armana art, etc. The article comes from an educational website, so I believe it should be accurate information. King Tut: The Pharaoh Returns! This is a long, but very informative article about King Tut's reign after the death of King Akhenaten. The article discus his reign from beginning to end and even discussed who discovered his tomb first and how it was done. The article comes from the Smithsonian.org website, so this should be considered pretty accurate information. This article talks about when the tomb of King Tut was first discovered and describes what was inside. Learning more about each artifact, this gives us more information about King Tut. The article comes from History.com, so it is a reputable and accurate source of information. This is an article about whether or not there is more to be found in Tut's tomb. If there is more artifacts to be found in his tomb, there is definitely more to learn about him and his reign. This article also comes from the National Geographic website, so It is considered to be accurate information. This is an article about the possible ways King Tut may have died. His death is important because if we were to find out his cause of death, we could possibly understand more about his life. This article was from the National Geographic website, so I believe it is fairly accurate and reputable. This is another interesting article about the possible ways King Tut may have died. The article is from a historical website, so the information contained in the article should be accurate. This is an original article written in 1923, at the time when King Tut's tomb was first discovered and opened. This is important because it shows how huge of a discovery this was and what it told us about the Egyptian dynasties of early civilization. Since it is a primary source of information, it is very accurate. This is picture of the inside of King Tut's Tomb. This is important because it gives us an idea of what toms looked like. 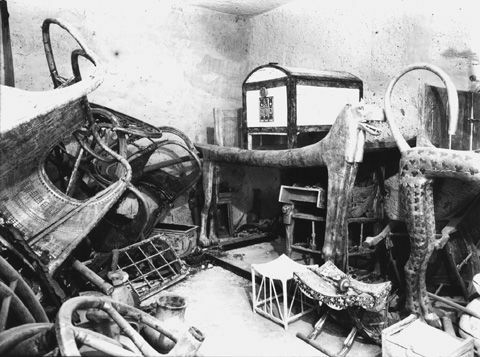 The picture was taken from the The Griffith Institute Tutankhamun: Anatomy of an Excavation The Howard Carter Archives. It is also a primary source of information, so it is very accurate.